Though I’m writing reviews for Books 4-7 all at once, and posting separately, I haven’t mentioned until now that the regular cast of characters besides Temeraire and his human buddy Will Laurence has really grown to a large group of familiars. 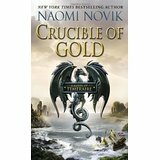 I have to give giant props to Naomi Novik for building a world of details easy to absorb and remember, and still read super quickly. This book, number 7 of the series, brings us to South America, one of the few continents not yet visited by Temeraire and Laurence on their various adventures. Their journey into Incan territory was not scheduled, but rather neccesitated by a series of pretty exciting events, totally surprising to me, even though at this point, I’m constantly trying to guess ahead. Novik keeps me guessing, and still keeps getting the jump on me. Temeraire and Laurence and their merry band of pals just keep making history, making peace, winning battles, and building international bridges. I said in my review of Book 6 that Temeraire is like Forrest Gump (except really freaking smart), and I stand by that. And as I’ve also mentioned in past reviews, I continue to adore meeting dragons and creatures in new areas of the world: Incan dragons have feathers, which is awesome and imaginative. Their mode of dressing up (because dragons like shiny things and have culturally unique ways of “showing away”) sound gorgeous, and their societal dynamic with humans is, as usual, more interesting food-for-thought for the reader, and of course for Temeraire and Laurence, who are trying to navigate their own civil rights movement for dragons, a passion Temeraire in particular continues to keep active, despite the years and distance between him and England. Novik just keeps tying it all together and layering it deeper and deeper. Have I mentioned I’m loving this series? Share the post "Dragons with feathers!"